New battery materials developed by the Pacific Northwest National Laboratory and Vorbeck Materials Corp. of Jessup, Md., could enable electric vehicles, power tools and even cell phones to recharge in minutes rather than hours. In collaboration with Vorbeck and researcher Ilhan Aksay at Princeton University, PNNL has demonstrated that small quantities of graphene—an ultra-thin sheet of carbon atoms—can dramatically improve the power and cycling stability of lithium-ion batteries, while maintaining high energy storage capacity. The pioneering work could lead to the development of batteries that store larger amounts of energy and recharge quickly. New battery materials developed by the Department of Energy's Pacific Northwest National Laboratory and Vorbeck Materials Corp. could enable electric vehicles and other consumer electronics to recharge in minutes rather than hours. 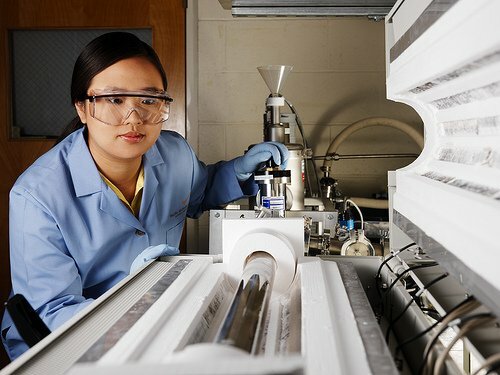 Here a PNNL researcher prepares and tests lithium ion batteries and lithium/air batteries for vehicle and other mobile applications. Battelle, which operates PNNL for DOE, entered into a Cooperative Research and Development Agreement with Vorbeck for use of its unique graphene material, Vor-xTM, in battery materials synthesis research. Click here to read the announcement from Vorbeck.